Many people look forward to the morning only because they know that they’ll be drinking a cup of joe. There is something quite magical about how coffee can completely change your mood and boost your energy levels in the morning. However, even though coffee can increase your energy enough for you to function and think properly, it usually isn’t enough to enhance your performance during a run. 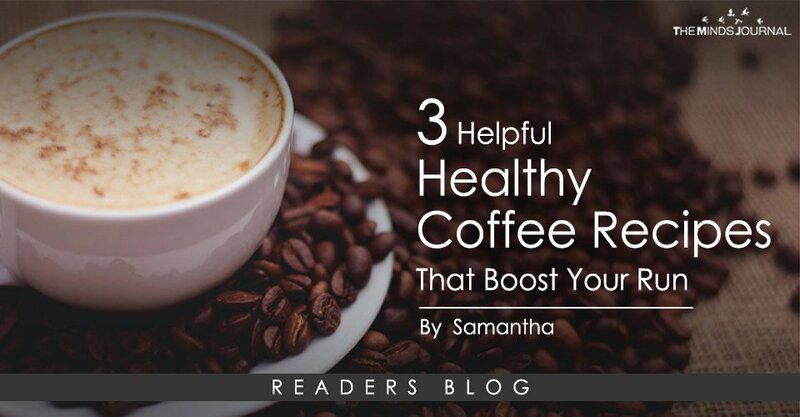 Thankfully, you can try the following 3 healthy coffee recipes with natural energy boosters that will surely help power your runs. Not only is this a better and healthier option than the numerous energy boosters on the market today, but it is more affordable as well. This is an impressive, simple recipe that will surely boost your run. Simply add 1-2 teaspoons of coconut oil and a tablespoon of cacao powder to your coffee, and you will be ready to go jogging. Coconut oil is a great addition to your morning cup of joe because it contains a lot of medium-chain fatty acids, which are substances known for increasing energy levels. On top of that, it will help you burn fat and aid you in weight loss. It’s also vital to note that you shouldn’t confuse the second ingredient with cocoa powder. Putting cocoa in your coffee won’t do anything but change its flavor. However, when you put cacao powder in the coffee, it will stimulate a flow of endorphins that will give you with the energy to complete your run almost effortlessly. This ingredient contains another natural stimulant known as theobromine, which is known for helping burn fat. One of the best methods to boost your performance during a run is to add 1-2 tablespoons of unsalted, grass-fed butter and 1-2 tablespoons of medium-chain triglyceride oil. When you do this, you get a drink that is commonly referred to as the bulletproof coffee. This drink has become popular recently, after NBA players, surfers, and other famous people started talking about it. A tech entrepreneur named Dave Asprey is the man who came up with the idea for this beverage. It quickly became popular because it promotes weight loss, suppresses hunger, boosts your energy levels, and enhances your performance. It’s super easy to make this drink, and you will surely notice a difference in your energy levels and performance once you drink it. This beverage is so recognized across the United States that there is currently even a Bulletproof coffee shop in Santa Monica where they sell the coffee. Cinnamon and cardamom are both very delicious and healthy spices. To make this drink, you can simply add a teaspoon of cinnamon and a teaspoon of ground cardamom into your coffee. In case you don’t feel like going for a run due to muscle soreness, the cinnamon will help you with its anti-inflammatory properties and get you moving. On the other hand, the Middle Eastern spice known as cardamom is known for boosting energy levels and improving circulation, which is why I wondered if I should get this since it’s very important when you’re going for a run.